Turning the page on the people, places and possessions that anchor the only life you have known, you wave goodbye to family and friends, walk away from your job, bid farewell to your favorite corner café and leave behind most of your worldly belongings to open a whole new chapter as your spouse pursues the opportunity of a lifetime at UC Berkeley. Yet amid the excitement and adventure of the big move, trailing spouses often can feel like outsiders in the college community as their identity gets lost in translation. Take Wendy Lukkien, who arrived in Berkeley from the Netherlands with her husband, a postdoctoral fellow at Berkeley’s College of Chemistry, eight months ago. Lukkien struggled to find her feet at first. “In the beginning I was becoming more and more isolated, staying in and not doing things unless it was with my husband. I didn’t feel like I was creating enough for myself here,” says Lukkien. “You’re leaving your whole life behind and you have to start over from scratch, friends, job, everything, and that’s really difficult if your husband is away all day and you’re at home by yourself all the time,” Lukkien says. A new class titled “Creating a Fulfilling Life in America” aims to ease the transition by helping the spouses of international scholars, postdocs, students and researchers adjust to the translocation, rediscover their sense of identity and build a meaningful new life here. A 1998 University of Montana study of its international scholars found that spouses who remain lonely and do not adjust well often cause a hardship for the scholars, negatively impacting their life and academic work. With Lefort focused on building connections and developing skills, the six-week course covers a range of topics from managing transitions and culture shock to developing strategies for meeting Americans and creating a social life. Participants also learn about coping with stress, finding balance in one’s life and nurturing their interests and skills through volunteering. VSPA course helped Yu build new life. “The class opened the door to a lot of options and resources and helps you understand how things work and how to get started in a new country. 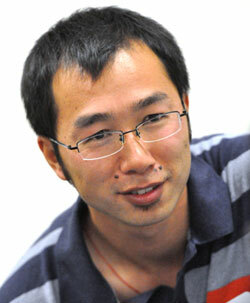 I’ve seen a change in myself and my outlook where I’m more positive and more outgoing,” says Bin Yu, who is from China. Yu’s wife is working in molecular and cell biology. Isolation, coupled with cultural alienation and disruption in the core sense of identity can lead to frustration, loneliness and depression, and the final session included a presentation by University Health Services about the confidential psychological services offered to international spouses at the Tang Center. “Strange food, culture, language, visa issues, transport, health care, the list just goes on and on. And not having family and friends, not having a social support system, while your spouse is working 80 hours per week, it’s easy to see how anyone could struggle initially,” says Sam Castañeda, program director at Berkeley’s Visiting Scholars and Postdoc Affairs program, which organized the course. Rounding out each 90-minute class session, an hourlong catered lunch allows participants to mingle and share experiences with classmates outside the learning environment. “Giving it a little touch of the personal by providing lunch just complements the whole effort,” Castañeda says. Some 35 expatriate spouses from 20 countries across three continents signed up when VSPA circulated an email announcing the course. VSPA used English-language proficiency to whittle down the pool of applicants to 25 and funded the new class through its existing program budget. On the back of its success, “Creating a Fulfilling Life in America” is tentatively scheduled to be offered again in the fall as part of a broader campus effort to centralize support services and resources for the families of international scholars, graduate students and researchers. A number of universities across the United States provide dedicated programming to address the needs of international spouses: language and conversation courses, workshops, personal and professional development services, recreation and wellness classes, support, and discussion groups, social activities and tours. “At Berkeley, it seemed like different departments were doing different things, Graduate Division is doing a little something, University Village is doing something, but it really wasn’t developed as a structured, coordinated program and one hand didn’t know what the other was doing,” Lefort says. Last semester, the campus’s international community included about 1,900 graduate students, 1,500 postdoctoral fellows, 1,400 visiting scholars and 500 visiting student researchers — with the majority married or partnered. Castaneda’s office is well placed to fill that void. One of the first postdoctoral offices in the nation, Berkeley’s VSPA program has more than 15 years of experience providing services to international scholars and researchers. VSPA already provides four sections of English-language courses for its population of international scholars. Offered through a private contractor at the Berkeley Language Center, the ESL classes are open to expatriate spouses. In 2006, VSPA collaborated with the University Village’s Family Housing program and Human Resource’s CALS Project to provide similar programming support for other campus populations. “America 101: Life in the U.S.A.,” which targets foreign-born scholars and campus service workers, continues to help individuals navigate American cultural practices and habits, including colloquial speech, personal greetings, restaurant protocol, telephone conversations and appropriate job-interview behavior. In 2009, VSPA introduced “Pronouncing American English,” a six-week class that employs the services of a trained speech pathologist to help international scholars enhance their ability to communicate in academic and professional situations. Offered twice per semester with the cost covered by client fees, the evening class is also open to expatriate spouses. “Of course, a number of other units already do some of this stuff, so I see VSPA taking on the role of coordinator because the services are scattered and nobody has charge of taking care of this community,” Castañeda says. Having identified a need for services, organization and coordination, VSPA established a steering committee — bringing together decision-makers at the Berkeley International Office, CALcierge, Graduate Student Services, International House, University Health Services and University Village — and is working closely with key stakeholders to gather together what each individual unit can contribute as they develop a master plan. “The fact that all these people were in the same room for the first time learning that we were all kind of doing a little bit, there was real excitement that this population could be well served without a lot of additional work just by having someone to push things forward and make sure we got things done… and that’s my job,” Castañeda says. In addition, Castañeda is hopeful he can persuade the Career Center to provide support services to expatriate spouses and take on a group that is technically outside its client base. “This collaboration will ensure that collectively, we’re not reinventing the wheel, but are more focused on bringing together and building on what we’re all doing already,” Castañeda says. Beyond cultural, practical, language and wellness programming, Castañeda ‘s office is also exploring the feasibility of a variety of other activities and events, including monthly tours to regional attractions such as the Napa Valley, to foster community-building and participation among international spouses. In a similarly social vein, the Berkeley International Office, which provides advice, immigration services, programming and workshops for international scholars, will offer a series of tea-and-talk sessions this fall on topics of interest to international scholars and their spouses. Looking to the future, Lefort sees a great opportunity to develop a program in which spouses can use their skills and abilities to create the support services that would best meet their needs — a program that engages the broader community, creates connections with corporations and does not cost the university anything. “I see this evolving, and I’m holding this vision for an international center for families from other countries — a space where people can come and have all kinds of activities and events,” Lefort says. Seeing the success of Lefort’s class and other initiatives as concrete confirmation of the need to do more, Castañeda agrees. “It’s kind of a piece-by-piece thing that we’ve done across many areas and now we’re trying to expand our efforts,” Castañeda says. “Hopefully we can gain some momentum now moving forward. “Princeton does it, Stanford does it, all our peers do it — well, we can do it too,” he adds.